Olive tree seedlings – Is it recommended to grow Olive tree from seedling? Olive tree seedlings it’s possible to start, but it’s the same as to start from seeds, there is no different except in the moving the seedling can die, germination of olive tree it’s easy, the best way to start cutting or graft tree. 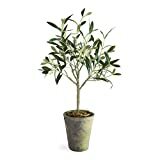 Porch & Petal DI1214 Olive Tree Potted, 17"